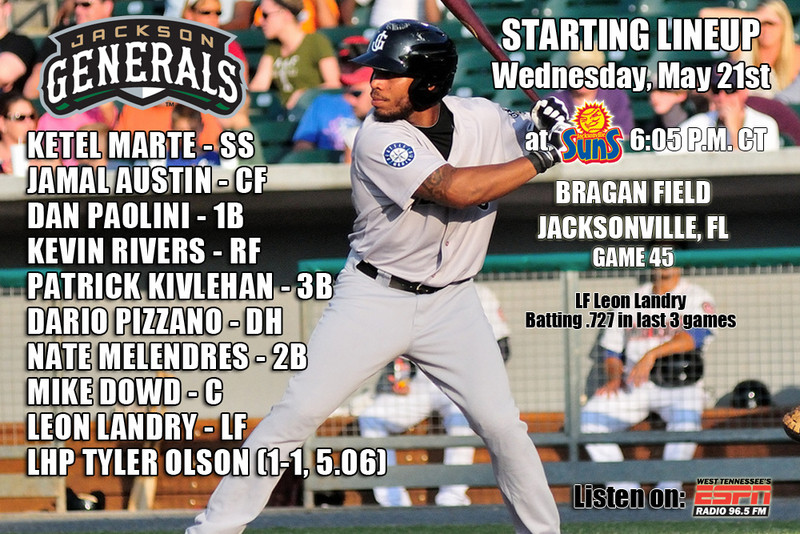 • The Generals open up their longest road trip of the season tonight in Jacksonville, with game 1 of a 5-game series against the Suns…the Generals will move on to Mobile for a 5-game set to follow…have dropped 6 straight series’ after winning first 3. • The Generals scored 9 runs over the 3rd-7th innings, but it wasn’t enough as Jackson lost to Montgomery 11-9 on Monday afternoon. • CF Leon Landry (4×4, R, 3 2B, 2 RBI) led the team with 4 hits, while LF Dan Paolini (2×4, R, 2 2B, RBI, BB), C John Hicks (2×3, R, RBI, BB) and 1B Mickey Wiswall (2×4, R, RBI) each recorded 1 of the team’s 11 hits. • Starter Cam Hobson (4.1,9,5,5,3,2,HR) allowed 5 runs on 9 hits in 4.1 innings, but did not factor into the decision. LH Kyle Hunter (1.2,2,1,1,0,0,HR), RH Richard Vargas (0.2,2,3,3,4,1) and LH Nick Hill (1.1,2,2,2,1,1) combined to allow 6 runs over 3.1 innings in relief, while RH Mayckol Guaipe (1.0,0,0,0,0,0) tossed a 1-2-3 9th inning. Hill recorded his first loss of the season with Jackson, after allowing 2 runs in the 8th inning. • The Generals concluded their rain-shortened homestand on Monday in which 132 runs were scored in 9 games. • The Generals batted .295 (89×302), but were out-scored 71-61 and lost 6 of 9 against Tennessee and Montgomery. • C John Hicks has expanded his league-leading on-base streak to 19 games. During the streak Hicks is batting .300 (21×70), with 4 doubles, 1 triiple, 11 runs, 9 walks, 10 RBI and a .375 OBP. The streak is the 4th-longest this season in the SL. (John Andreoli TNS, 30, Kris Bryant TNS, 24, Trayce Thompson BIR, 20). Hicks also currently has an 9-game hit streak, batting .394 (13×33) with 9 runs scored, 3 doubles, 1 triple, 6 RBI and 4 walks. • OF Leon Landry has recorded multi-hit games in each of his last 3 games batting .727 (8×11) with 1 run scored, 5 doubles,1 triple and 3 RBI. Landry has risen his batting average from .155 to .211 during this stretch. • Landry recorded his 9th career 4-hit game Monday and first since Aug. 10, 2012 vs. Bakersfield (w/High Desert). • INF Jack Marder has hit safely in 6 of his last 7 games, batting .368 (7×19) with 8 runs scored, 2 doubles, 3 RBI and 6 walks. • C Mike Dowd has hit safely in 6 of his last 7 games with 3 multi-hit contests, batting .360 (9×25) with 4 runs scored, 1 double, 1 triple, 1 home run, 4 RBI and 3 walks. Jackson starter Trevor Miller has recorded a win in each of his last 3 appearances, going 3-0 with a 1.02 ERA (2 ER, 17.2 IP). During this stretch he has limited opponents to a .167 average (10×60), while walking 6 and striking out 12. Since April 21, Miller is 3-2 with a 2.34 ERA (9 ER, 34.2 IP) in 6 games (5 GS). During this stretch he has lowered his season ERA from 7.30 to 3.64. • The Generals and Suns meet 10 times during the 2014 and the clubs are seperated by 711 miles (farthest opponent for Generals). • Last season the teams met just 8 times with 2 games being cancelled due to rain. 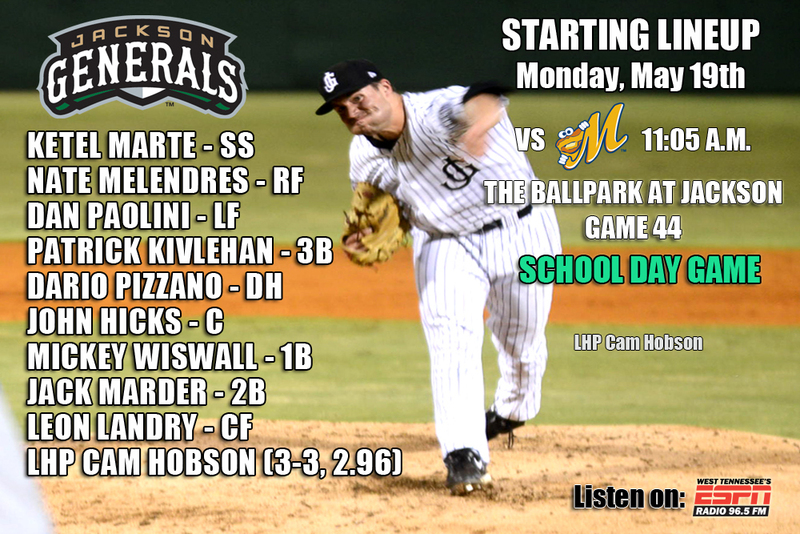 Jackson went 3-5 against Jacksonviile last season including going 2-3 at Bragan Field. 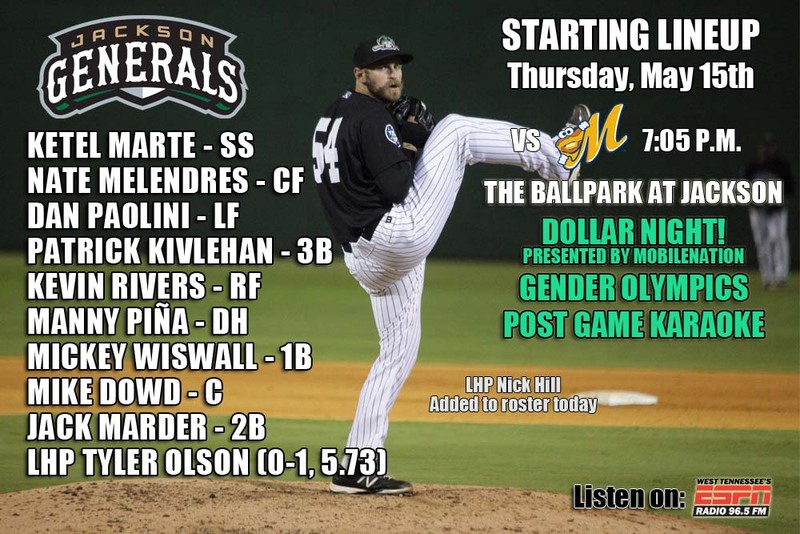 • Only 7 of the Generals current roster have played at Bragan Field (Position players John Hicks, Jack Marder, Leon Landry and pitchers Moises Hernandez, Nick Hill, Kyle Hunter and Stephen Kohlscheen. • The Generals and Biscuits play the rubber match of the 5-game series this morning with the set tied 2-2…this is the 2nd leg of rain-shortened 9-game homestand (3-5) with Tennessee and Montgomery…have dropped 5 straight series’ after winning first 3. • Mickey Wiswall (2×3, 2 R, 3 RBI) homered and John Hicks (2×3, 3 R, BB) and Mike Dowd (2×3, R, RBI) added 2-hit games as Jackson defeated Montgomery 8-1 to even the series at 2-2 on Sunday night. • Wiswall’s homer in the 5th propelled Jackson to a 4-run inning and they came from down 1-0 to win the game. • Starter Trevor Miller (6.1,3,1,1,3,4) improved to 3-4 and won his 3rd straight outing (2 starts, 1 relief) working into the 7th inning on Sunday. • Relievers Stephen Shackleford (1.2,1,0,0,0,3) and Stephen Kohlscheen (1.0,0,0,0,0,0) combined to go 2.2 innings to finish off the win. • Dario Pizzano (1×4, R) racked up his first AA hit with a single in the 6th inning. • When the Generals scored 4-or-more runs in a game this season they are 17-4. When the Generals fail to score 4 runs they are 1-21. • C John Hicks had 2 hits on Sunday and extended his league-leading on-base streak to 18 games. During the streak Hicks is batting .284 (19×67), with 4 doubles, 1 triiple, 10 runs, 8 walks, 9 RBI and a .355 OBP. Hicks also currently has an 8-game hit streak, batting .366 (11×30) with 8 runs scored, 3 doubles, 1 triple, 5 RBI and 3 walks. • INF Jack Marder has hit safely in each of his last 6 game he has appeared, batting .412 (7×17) with 6 runs scored, 2 doubles, 3 RBI and 4 walks. • C Mike Dowd has hit in 6 of 7 games and in May is batting .321 (7×25) with 1 double, 1 triple, 1 home run, 4 RBI and a .387 OBP. • SS Ketel Marte doesn’t have a hit in his last 13 at-bats, but has hit safely in 13 of his last 16 games, batting .294 (20×68) with 9 runs scored, 6 doubles, 1 triple, 6 RBI, 3 walks and 9 stolen baes. After recording only 2 stolen bases in his first 17 games to begin the season, Marte has stolen 12 bases in his last 22 games. • Marte currently ranks 6th in AVG (.306), 2nd in doubles (12), T-4th in stolen bases (14) and T-2nd in hits (48) in the SL. • Former LSU Tiger and Jackson OF Leon Landry has recorded 4 hits in his last 7 at-bats with 2 doubles, 1 triple and 1 RBI. • Montgomery and Jackson meet 20 total times in 2014, which is the 2nd-longest season series (Huntsville). Thus far the season series is even at 2-2. • All-time the Generals are 83-78 against Montgomery and 49-34 against the Biscuits in Jackson.since Montgomery’s franchise began in 2004. • In 2013 the Generals went 10-5 against the Tampa Bay Rays AA affiliate including 7-3 in games played in Jackson. • Trailing in the series 2-1, the Generals and Montgomery play game 4 of the set tonight …this is the 2nd leg of rain-shortened 9-game homestand (2-5) with Tennessee and Montgomery…have dropped 5 straight series’ after winning first 3. • The Generals out-hit the Biscuits 7-5, but Jackson was shutout by Montgomery 4-0 on Saturday. • 1B Mickey Wiswall (2×4) and LF Leon Landry (2×3, 2B, 3B) each recorded 2 hits, while CF Jamal Austin (1×3, BB, SB), RF Kevin Rivers (1×4) and C Manny Pina (1×4) each recorded 1 of the Generals 7 hits. • Starter Victor Sanchez (4.0,2,3,0,3,2,HR) recorded his first loss of the season after not allowing an eanred run (3 R) in 4.0 innings. RH Moises Hernandez (4.0,2,1,1,1,HR) allowed 1 run in the 6th inning, while RH Mayckol Guaipe (1.0,1,0,0,0,1) tossed a scoreless 9th inning. • C John Hicks had an RBI and a triple last night and extended his on-base streak to 16 games. During the streak Hicks is batting .266 (17×64), with 3 doubles, 1 triiple, 7 runs, 7 walks, 9 RBI and a .333 OBP. It’s the longest active streak in the league. Hicks also currently has a 7-game hit streak, batting .333 (9×27) with 5 runs scored, 2 doubles, 1 triple, 5 RBI and 2 walks. • INF Jack Marder has hit safely in each of his last 5 game he has appeared, batting .429 (6×14) with 6 runs scored, 2 doubles, 3 RBI and 3 walks. 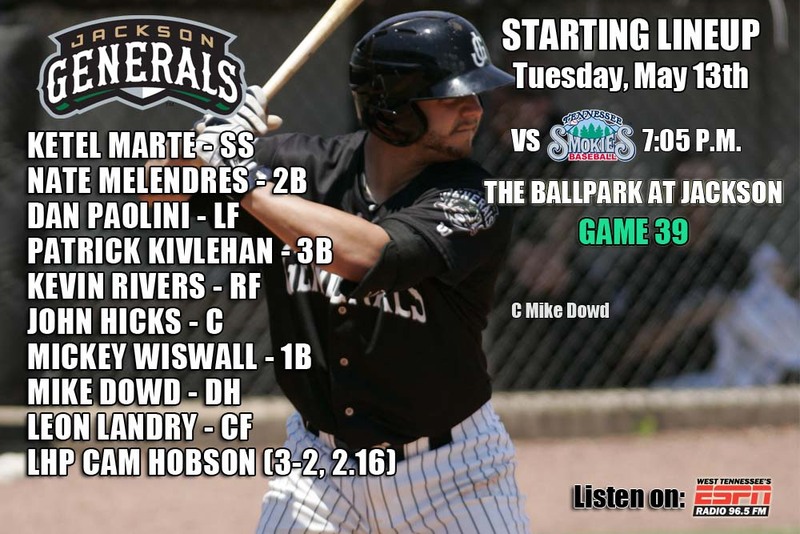 • C Mike Dowd saw his 5-game hitting streak come to an end on Thursday, but in May Dowd is batting .280 (7×25) with 1 triple, 1 home run, 3 RBI and a .357 OBP. • SS Ketel Marte has hit safely in 13 of his last 15 games, batting .317 (20×63) with 9 runs scored, 6 doubles, 1 triple, 6 RBI, 3 walks and 9 stolen baes. After recording only 2 stolen bases in his first 17 games to begin the season, Marte has stolen 12 bases in his last 21 games. • Marte currently ranks 5th in AVG (.316), 2nd in doubles (12), 4th in stolen bases (14) and T-2nd in hits (48) in the SL. • Jones has appeared in 14 total games, with hits in 11 of those games, including a current 8-game hitting streak. • Montgomery and Jackson meet 20 total times in 2014, which is the 2nd-longest season series (Huntsville). Thus far Montgomery leads the season series 2-1. • All-time the Generals are 82-78 against Montgomery and 48-34 against the Biscuits in Jackson.since Montgomery’s franchise began in 2004. 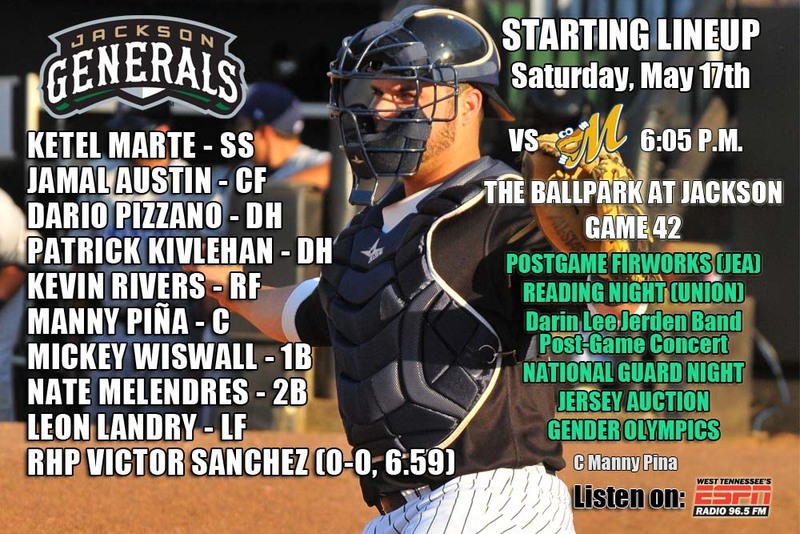 • The Generals continue the 5-game series with Montgomery with game 4 of the set …this is the 2nd leg of rain-shortened 9-game homestand (2-4) with Tennessee and Montgomery…have dropped 5 straight series’ after winning first 3. • The Generals couldn’t rebound from a 5-run 2nd inning as Jackson lost 2-10 to Montgomery on Friday night. • 1B Dan Paolini (2×3, BB), C John Hicks (2×4, R, 2B) and CF Leon Landry (2×4, 2B, RBI) each recorded 2 of the Generals 8 hits. Landry and 3B Jack Marder (1×4, R, 2B, RBI) each drove in a run for Jackson in the bottom of the 2nd innings. Stephen Kohlscheen (1.1,2,1,1,1,2) allowed a combined 4 runs over 5.0 innings in relief. • After 41 games the Generals are still the toughest team in the league to strikeout only going down on strikes only 6.65 times per game. • Jack Marder (2nd, 1/10.18 AB), Jamal Austin (3rd, 1/10.13 AB) and Ketel Marte (4th, 1/10.06 AB) rank among the toughest in the league to K.
• SS Ketel Marte has hit safely in 13 of his last 14 games, batting .339 (20×54) with 9 runs scored, 6 doubles, 1 triple, 6 RBI, 3 walks and 9 stolen baes. After recording only 2 stolen bases in his first 17 games to begin the season, Marte has stolen 12 bases in his last 20 games. • Marte currently ranks 2nd in AVG (.324), 2nd in doubles (12), 4th in stolen bases (13) and T-2nd in hits (48) in the SL. • During the first 6 games of the homestand Jackson has scored 44 runs and posted a .305 AVG with 3 home runs and 43 RBIs. • So far there have been 99 runs scored in total during the first 6 games of the rain shortened 9-game homestand. • Montgomery and Jackson meet 20 total times in 2014, which is the 2nd-longest season series (Huntsville). Thus far the season series is tied at 1-1. • OF Leon Landry batted just .163 (8×49) against Montgomery. last year, but had 3 of his 6 HR of 2014 in 13 games against the Biscuits. He also had 8 RBI. • Last season Jackson pitching posted a 2.53 ERA in the 15 games against Montgomery. • The Generals continue the 5-game series with Montgomery with game 2 of the set …this is the 2nd leg of rain-shortened 9-game homestand (2-3) with Tennessee and Montgomery…have dropped 5 straight series’ after winning first 3. • The Generals scored 5 runs in the 2nd inning and 3 more in the 4th inning, as Jackson cruised to an 8-2 win over Montgomery on Thursday night. • SS Ketel Marte (2×4, 2 R, 2B, 3B, 4 RBI) and CF Nate Melendres (2×4, 2B, 3 RBI, SB), the Generals 1-2 batters in the lineups, combined to drive in 7 of the team’s 8 runs on 4 hits. • 3B Patrick Kivlehan (2×4, R) and RF Kevin Rivers (2×4, R) each recorded 2 of the Generals 11 hits. • LHP Nick Hill was transferred to Jackson from AAA Tacoma on Thursday after appearing in 11 games (1 start) for the Rainiers. • Hill has pitched 115 games for the Jackson franchise dating back to 2009, including 11 starts and 3 complete games in 2009. • Hill is a Tennessee native from Bluff City, TN and went to Sullivan East High Schoo. From there he went on to the United States Military Academy. • C John Hicks had an RBI and a triple last night and extended his on-base streak to 16 games. During the streak Hicks is batting .250 (15×60), with 2 doubles, 1 triiple, 6 runs, 7 walks, 9 RBI and a .324 OBP. It’s the longest active streak in the league. walks and 8 stolen baes. After recording only 2 stolen bases in his first 17 games to begin the season, Marte has stolen 11 bases in his last 19 games..
• Marte currently ranks T-2nd in AVG (.329), 2nd in doubles (12), 4th in stolen bases (13) and 3rd in hits (47) in the SL. • During the first 5 games of the homestand Jackson has scored 42 runs and posted a .305 AVG with 3 home runs and 41 RBIs. • So far there have been 87 runs scored in total during the first 5 games of the rain shortened 9-game homestand. • Montgomery and Jackson meet 20 total times in 2014, which is the 2nd-longest season series (Huntsville). Thus far Jackson leads the 2014 series 1-0. • The Smokies defeated the Generals Sunday night 17-13 and it was the most combined runs involving Jackson or West Tenn in franchise history. • The 30 runs combined were 5 short of the league record (35 in 1988, Orlando 18, Huntsville 17), but it was the first time in league history that 30 runs have been scored without a home run. • The game involved 29 hits, 5 errors, 20 runners left on bas1e and 15 of 18 starters had hits, 16 of 18 scored runs, 14 of 18 produced RBI’s. Every Smokies starter scored at least 2 runs except for Anthony Giansanti (0). • The time of game, 3 hours, 55 minutes was the longest 9 inning game this season in the Southern League. • The Generals begin a 5-game series tonight with the Montgomery Biscuits …this is the 2nd leg of a 10-game homestand (1-3) with Tennessee and Montgomery…dropped 5 straight series’ after winning first 3. • Wednesday’s series finale between the Generals and Smokies was cancelled due to the rain. The game will not be made up, as the two teams don’t meet again until the 2nd half of the season. Tennessee took 3 of 4 from Jackson in the series out-scoring the Generals 45-32 in the set. • LHP Cam Hobson allowed 4 runs in the 4th inning on May 13 vs. Tenessee, snapping a string of 23.0 innings without allowing an earned run over his last 4 starts. • C Mike Dowd has hit safey in his last 5 games, batting .368 (7×19) with 3 runs scored, 1 triple, 3 RBI and 2 walks. In the month of May he is batting .318 (7×22). walks and 8 stolen baes. After recording only 2 stolen bases in his first 17 games to begin the season, Marte has stolen 11 bases in his last 18 games..
• Marte currently ranks T-3rd in AVG (.324), T-2nd in doubles (11), 4th in stolen bases (13) and 3rd in hits (45) in the SL. • INF Patrick Brady has hit safely in each of his last 6 games, batting .375 (9×24) with 3 runs scored, 1 double, 1 triple, 1 home run and 6 RBI. • The Generals and Smokies have combined for 77 runs over the first 4 games of the series (TNS 45, JXN 32). This is the highest scoring series (4 or more games) in Jackson’s franchise history. • Last night there were 5 triples combined between the clubs (TNS 3, JXN 2) which was 2 shy of the Southern League record. 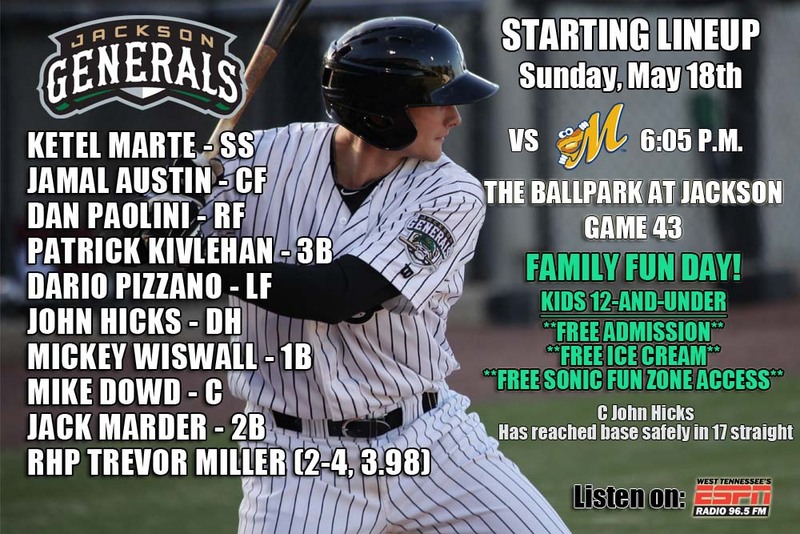 • The Generals and Smokies conclude their series this morning with game 5 of the set…this is the first leg of a 10-game homestand (1-3) with Tennessee and Montgomery…lost 4 of 5 on last road trip at Huntsville…dropped 5 straight series’ after winning first 3. • Jackson dropped their 5th consecutive series of the season with a 10-7 setback to the Tennessee Smokies on Tuesday night. • Ketel Marte (2×4, R, BB, K), Nate Melendres (2×5, 2 R, RBI) and Mike Dowd (2×3, BB) each had two-hit nights, but it wasn’t enough as the Generals were once again doomed by a big offensive inning for the Smokies. • Jackson starter Cam Hobson (3-3, 2.96) struck out five, but dropped to .500 on the year as he picked up third loss. • SS Ketel Marte now ranks T-3rd in batting AVG (.324), 3rd in hits (45), 4th in stolen bases (13) and is the 4th toughest player in the league to strikeout (1/10.1 AB). • RH Moises Hernandez, Felix’s older brother has not allowed an earned run in his last 8.1 innings in relief. • 2013 General James Jones has recorded at least one hit in all 6 of his starts this season, batting .368 (8×23) with 7 runs scored, 3 doubles, 3 walks and 1 stolen base. • 2012 Jackson catcher Mike Zunino extended his hitting streak to 6 games, batting .316 (6×19) with 4 runs scored, 2 doubles, 2 home runs and 2 walks. • The Generals and Smokies play 15 times this season and 10 of the 15 games occur at The Ballpark at Jackson. Currently the season is led by the Smokies 5-4. 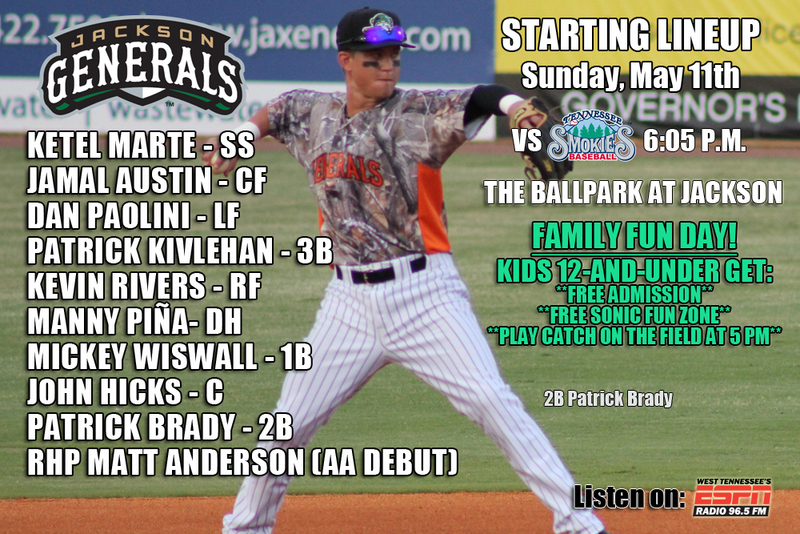 • Last season the Generals went 3-16 against the Smokies after going 17-7 against the Baby Bears in 2012. • The Generals took 3 of 5 against Tennessee in the series on Smokies Park, April 14-18. 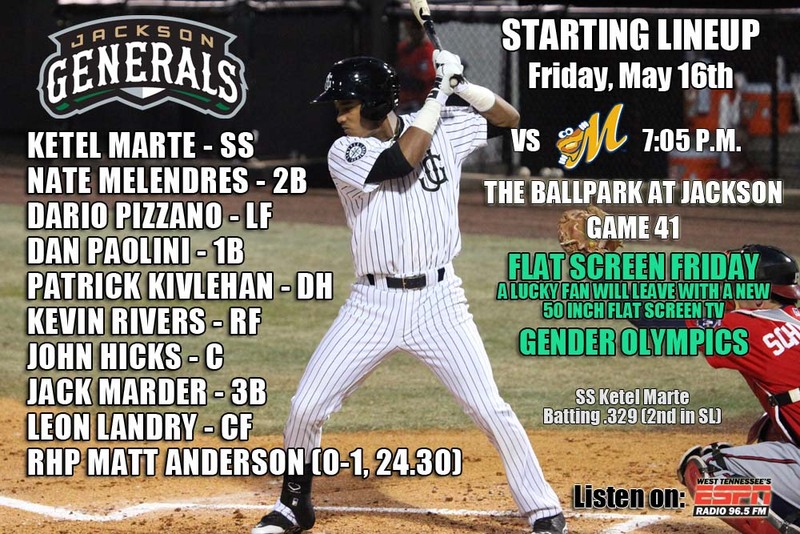 • Trailing in the series 2-1, the Generals look to even the series in game 4 of the 5-game set with Tennessee…this is the first leg of a 10-game homestand (1-2) with Tennessee and Montgomery…lost 4 of 5 on last road trip at Huntsville…dropped 4 straight series’ after winning first 3. • The Generals snapped their 4-game losing streak coming from behind to defeat Tennessee 8-6 Monday at home. Jackson used a 4-run 8th inning, capped by Mike Dowd’s (2×4, 2 R, 3 RBI, 3B, HR) 2-run homer to come from behind and pick up win number 16 on the season. • Jamal Austin (2×4, R, SB), John Hicks (1×4, 2 R, 2 RBI), Nate Melendres (1×4, RBI), Kevin Rivers (1×2, R) contributed to the 7 Jackson hits on the night. 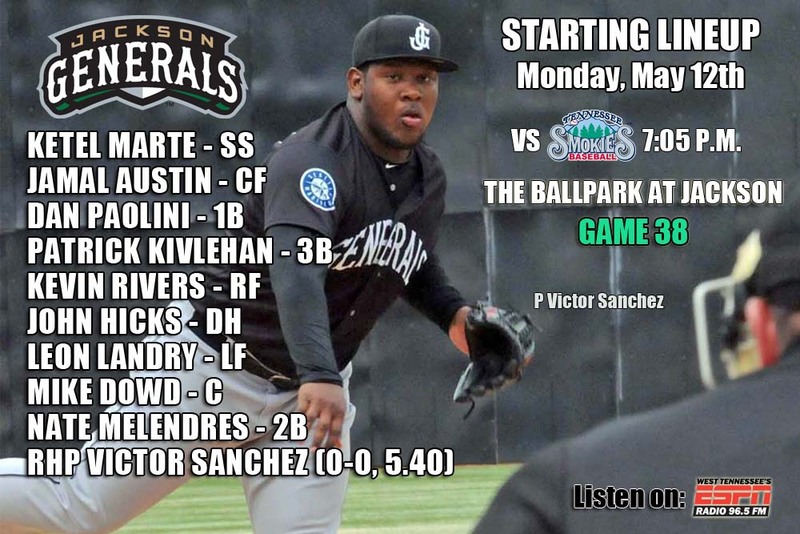 • Jackson starter Victor Sanchez made his first start since April 14th and took a no decision allowing 6 runs, 4 earned on 5 hits over 3.2 innings. He walked none and struck 5 including the Smokies’ side in the 3rd. • Trevor Miller (2-4, 3.98) made his 1ST relief appearance since June 24, 2012 and picked up the win tossing 5.1 scoreless innings, scattering 2 hits. He struck out 5 and walked just 2. • C John Hicks had a 2-run double last night and extended his on-base streak to 15 games. During the streak Hicks is batting .241 (14×58), with 2 doubles, 6 runs, 5 walks, 8 RBI and a .297 OBP. • SS Ketel Marte now ranks 4th in batting AVG (.319), 4th in hits (43), T-4th in stolen bases (12) and is the 4th toughest player in the league to strikeout (1/10.5 AB). • LHP Cam Hobson has not allowed an earned run in his last 19.0 innings over his last 3 starts. Since April 23, he is 2-0 with a 1.11 ERA (3 ER, 24.1 IP), while walking 7 and striking out 8 in 4 starts. Overall this season he has limited opponents to a .247 (38×154) average, including a .130 (3×23) clip vs. left-handed batters. He was named the SL Pitcher of the Week last week, April 29-May 4. • James Jones went 2-for-5 with 3 runs scored and a double (also reached on a fielder’s choice). • Mike Zunino hit his 6th home run of the season…entered the game T4th in the Majors in home runs amongst catchers behind Atlanta’s Evan Gattis (8), San Francisco’s Buster Posey (6) and Miami’s Jarrod Saltalamacchia (6). • Stefen Romero notched a career-high 3 hits and hit his first career home run at Safeco Field. • The Mariners have now earned their 20th win after playing 38 games … The last time the Mariners reached 20 wins in 38 games or fewer was in 2003 when their record after 31 games was 20-11. • The Generals and Smokies play 15 times this season and 10 of the 15 games occur at The Ballpark at Jackson. Currently the season series is tied at 4-4. • The Generals are trying to snap out of a 4-game losing streak in game 3 of the 5-game series with Tennessee…have dropped 9 of their last 10 overall…lost 4 of 5 on last road trip at Huntsville. • The Generals lost 17-13 to the Smokies on Sunday night. The 30 runs combined was a franchise record and just 5 shy of the Southern League all-time record. The Generals lost their 9th out of 10 games. • The game was 3 hours, 55 minutes which was the longest nine-inning game thus far this season in the Southern League. • Ketel Marte (4×6, 2 R, RBI, 2 SB, 2B) led the Generals with 4 hits and Manny Pina (1×2, 3 R, RBI, 3 BB, 2B), Patrick Brady (1×4, 3 RBI, BB, 3B), Mickey Wiswall (2×5, 2 R, 2 RBI, 2B), Kevin Rivers (1×4, 2 R, RBI, 2 BB), John Hicks (2×5, R, RBI), Dan Paolini (1×3, R, 2 RBI, BB), Jamal Austin (1×5, 2 R, BB, SB) had a part in the 13 hit performance. • Starter Matt Anderson (L, 0-1, 3.1,7,10,9,2,0) suffered the loss for Jackson. • The game involved 29 hits, 5 errors, 20 runners left on base and 15 of 18 starters had hits, 16 of 18 scored runs, 14 of 18 produced RBI’s. Every Smokies starter scored at least 2 runs except for Anthony Giansanti (0). • SS Ketel Marte has hit safely in each of his last 10 games, batting .357 (15×42) with 6 runs scored, 4 doubles, 2 RBI, 2 walks and 7 stolen bases. The hitting streak is the tied for the longest currently in the league (David Peralta, MOB). This is his 3rd hitting streak of 7 or more this season…After recording only 2 stolen bases in his first 17 games to begin the season, Marte has stole 8 bases in his last 14 games. • LHP Cam Hobson has not allowed an earned run in his last 19.0 innings over his last 3 starts. Since April 23, he is 2-0 with a 1.11 ERA (3 ER, 24.1 IP), while walking 7 and striking out 8 in 4 starts. Overall this season he has limited opponents to a .247 (38×154) average, including a .130 (3×23) clip vs. left-handed batters. • 19-year-old Victor Sanchez was activated from the DL yesterday and makes his 3rd start of the season tonight. • Sanchez was placed on the DL on 4/16 with right forearm tightness. • Sanchez is the 2nd-youngest starting pitcher (19.2) in franchise history to RHP Carlos Zambrano (18.8 in 2000) when the franchise was affiliated with the Chicago Cubs. • Sanchez is rated by Baseball America as the Mariners’ No. 7 overall prospect and 4th ranked pitcher. • 2010 Jackson alumnus Dustin Ackley hit 2 home runs Sunday in Seattle’s 9-7 loss to Kansas City after hitting 1 Saturday against the Royals. • It was the first multi-home run game of Ackley’s career. • First time to hit a home run in back-to-back games in his career. • Hit home runs in 3 straight plate appearances; his last plate appearance Saturday and his first two Sunday. • Hitting .355 (11×31) with 7 runs, 3 home runs, 6 RBI, .459 OBP, .645 slugging & 1.105 OPS in last 11 G.
• The Generals and Smokies play 15 times this season and 10 of the 15 games occur at The Ballpark at Jackson. Currently the season series is led by the Smokies, 4-3. • The Generals look to snap a 3-game losing streak tonight in game 2 of the 5-game series vs. Tennessee…coming off a 1-4 road trip at Huntsville and have dropped 4 straight series’ after winning the first 3 of the season. • DH Dan Paolini hit his first grand slam home run in the 2nd innings, but it wasn’t enough as Jackson lost to Tennessee 10-6 on Saturday night. • Paolini’s 4 RBI marked the 7th time in his career game with at least 4 RBI (last: 5, 4/28/13 vs. Stockton w/HD). • Starter Kyle Hunter (3.1,5,5,5,2,3,2HR) allowed 5 runs on 5 hits in 3.1 innings, but did not factor into the decision. LH Jordan Shipers (1.1,5,2,2,2,2) recorded his 3rd loss of the season, allowing 2 runs in 1.1 innings. RH Moises Hernandez (2.1,4,0,0,0,2) tossed 2.1 scoreless innings, while RH Mayckol Guaipe (2.0,4,3,3,1,2,2HR) allowed 3 runs over the final 2.0 innings. • Newest General INF Patrick Kivlehan recorded 12 multi-RBI games this season for High Desert. His 35 RBI currently ranks 2nd amongst all minor league players. • Dating back to August 1, 2013, Kivlehan has driven in 74 runs over 62 games in the minor leagues. During this 62 game stretch leads all minor league players. • Overall this season, he is batting .282 (40×142) with 24 runs scored, 9 doubles, 2 triples, 9 home runs, 35 RBI, 12 walks and 2 stolen base. • INF Patrick Brady has hit safely in each of his last 5 games, batting .400 (8×20) with 3 runs scored, 1 double, 1 home run and 4 RBI. • AAA: Tacoma, at Las Vegas 17-15, 1st, +0.5 SUSPENDED – WIND – Last night’s game between Tacoma and Las Vegas was suspended after the 7th inning due to severe wind with the score tied 5-5. • A+: Lancaster 12, at High Desert 5 21-16, T2nd, -1.0 L-Unsworth (2-3) The Mavericks recorded 10 hits, but it wasn’t enough as High Desert fell to Lancaster 5-12 on Saturday night. • A-: Peoria 8, at Clinton 6 (11 IP) 18-16, 4th, -7.0 L-Pagan (1-1) SS Jack Reinheimer drove in 3 runs in Clinton’s 6-8 loss to Peoria in 12.0 innings on Saturday night. • The Generals and Smokies play 15 times this season and 10 of the 15 games occur at The Ballpark at Jackson. Currently the season series is knotted at 3-3.